Do you have a TO DO list? Give it to me. "One handyman with a tool box can fix, repair, and install almost anything!" 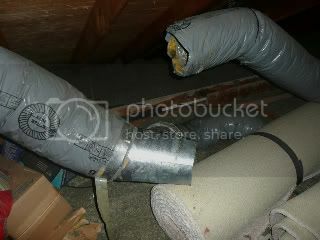 Disconnected AC vent in attic, NOT GOOD! 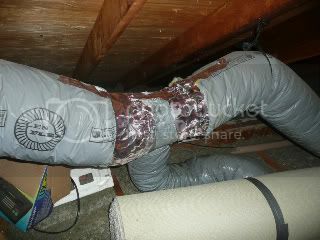 Huge loss of money and home cooling right into the attic space!. Reconnected, no loss of cold air and NO DUCT tape! CFM'S balanced in home after reconnection! 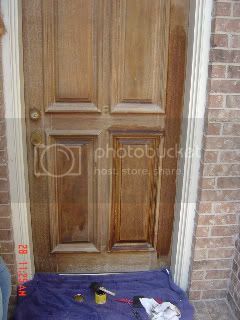 Another wood door beat up by the Texas weather. A little sanding, staining and TLC, like new. A little touch up, here and there. Window gone and ready to primer, customer will paint. Wall mud has been applied. Blurry! Applied small coat of primer, customer will paint. Ceiling leak and sheetrock damage. All the old sheetrock removed. Primered and waiting to paint. Painted and completed, paint is drying. 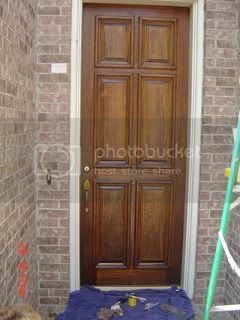 Wood doors can't stand the weather in Houston!. But...with a little TLC, good as new!. Same door but up close, not good! Wood rot gone, window reframed. New door installed and reframed. Install pet door from garage to backyard. Pet door phase 4, complete with interior trim, customer will paint. Wood Rot on a supporting column!. This is what it does to your home! Column repaired, wood rot gone! Leaves left in roof valley for a long period, causing rain accumulation and roof leak. Over a period of time, can cause a roof leak, soaking through shingles. Leaves removed, a lot of moisture to just sit's there and soaks through to your home. After removal of leaves, roof resealed, no more leaks. Keep leaves from accumulating on your roof! Rotted particle board under eave of roof. Attic rail needed at top of stairs. Window reframed and wood rot gone! Garage trim replaced with Hardi-Plank and painted. Closer look at needed repairs due to wood rot. Closer look at repairs near completion. New gate and partial fence needed. New gate and partial fence replaced. Old gate and fence from inside the backyard. New gate and fence repaired, inside view. Damaged window from wood rot, leaking rain into home. Wood rot removed, windows repaired & sealed - need to paint! Shutter blown off during storm. Shutter reattached, like it never happened! Toilet not to code, no fill tube! Toilet rebuilt, now up to code with fill tube. Another look, needs new rail$$$?. Repaired, no new rail needed! Another view of new vinyl fence. Picture 2 of broken gate. No new gate, gate repaired! Picture 2 of repaired gate. Leak around chimney flashing, fixed and sealed! Another picture of the chimney. Needed a new vinyl fence. New fence done and in place. Another view - No Fence! Roof flashing repaired and sealed. Wood rot, door frame leftside. New Door and some concrete patching at the base. 7). Needed a doggie door. 8). Doggie door completed....before cleanup. 9). Wood rotted around windows. 10). Windows completly reframed and painted to match. 11). Uh Oh, Shower Mold! 13). More mold, same shower. 14). After recaulking, mold is gone. 17). Old toilet guts, no fill tube! 18). Toilet, minor rebuild complete. 19). Customer wanted new curtain rod. 20). Heavy duty curtain rod, Done! Please take time to fill in the information on the Christian Handyman Service contact form.